Hello to all you super fit, green vested, lithe limbed, mountain running, road bashing. park running afleets. Hope this round up finds you all well. We have had a fantastic week of running this past week, and I shall start with the fantastic achievement of our CBH (Chris Baynham-Hughes in his official capacity). 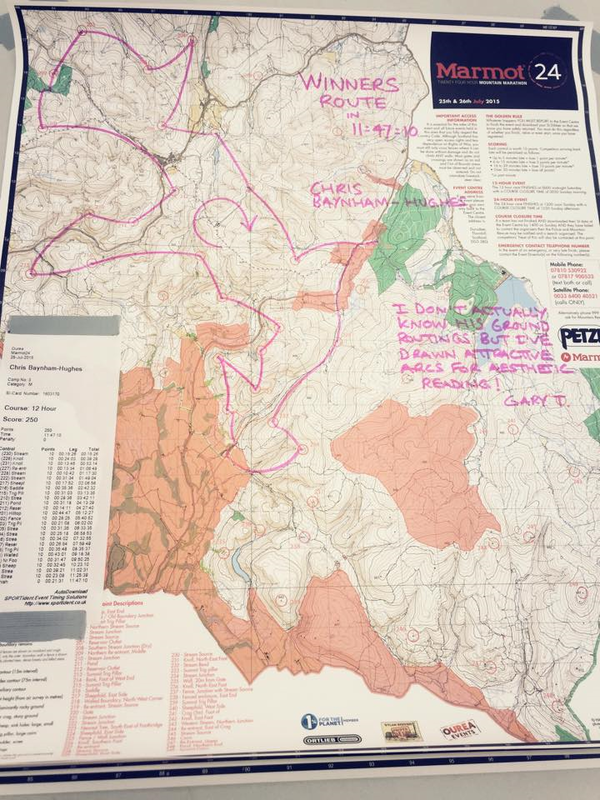 He managed to not only win the Marmot24 marathon but he was ecstatic to note he has drawn some fabulous Strava art in the form of a Scottish Highland Terrier! It’s the little things… I shall pass you on to CBH for his report but a HUGE well done Chris, you are an unbelievable endurance runner who it seems, was born with an inbuilt GPS system! The format was simple, start at 12 noon on Sat and visit as many controls as you can within 12 or 24 hours. The ground was rough but runnable and the climbs were very steep but short; the result being that I was able to run for almost all of it. I had to expand my original route plan several times on the hoof as I was passing through the controls quicker than expected. Things were going very well indeed. The weather was amazing – hot sunshine all day and very little wind – and I felt like I had the place all to myself and only occasionally bumping into other competitors. I was running really well and had run everything so I started to believe I might be in contention by the end of the day. Running rough ground in the pitch black with a head torch reflecting off sheep and rabbit eyes left me panicking I’d miss the cut off. I’d taken the risk to get the extra points and I’d bagged two additional controls, but whilst I was still running well the lights of the finishing camp seemed very far away as I tried to descend and get back for the Midnight cut off. Terrified of losing hard earned points I sprinted (well, it felt like that) to the finish. I arrived with 10 minutes to spare having covered 43.7 miles and 10,500ft (I had my GPS in a tamper proof opaque bag to track me: https://www.strava.com/activities/354240917) I took 25 controls (250 points) and 25 minutes later was confirmed as the winner! My first win ever, I was slightly shocked and very happy indeed. Moving on to more mountain off roading, our Mountain Goat mascot, Jim Jones and his side-kick kid, Philip Roberts with a finely tuned Alec Robertson strapped on their trail shoes and hit the Snowdonia Trail marathon in err, you guessed it… Snowdonia. Honours go to Alec who finished first in his age category. It was a tough race made even harder by the driving rain at the start and finish with only spells of respite in between. The race started and finished in Llanberis and went through Rhyd Ddu, Beddegelert, Nant Gwynant and Pen y Pass before starting the climb of Snowdon at about 20 miles. The climb up Snowdon in the driving rain was a challenge in itself with a risk of body temperatures dropping if you didn’t keep moving. The route was well marked out but it seems the organisers may have made an error when calculating the distance as a lot of people recorded 29 miles on their devices. It was certainly stamina building getting to 26 miles and finding you’re still nowhere near the finish. 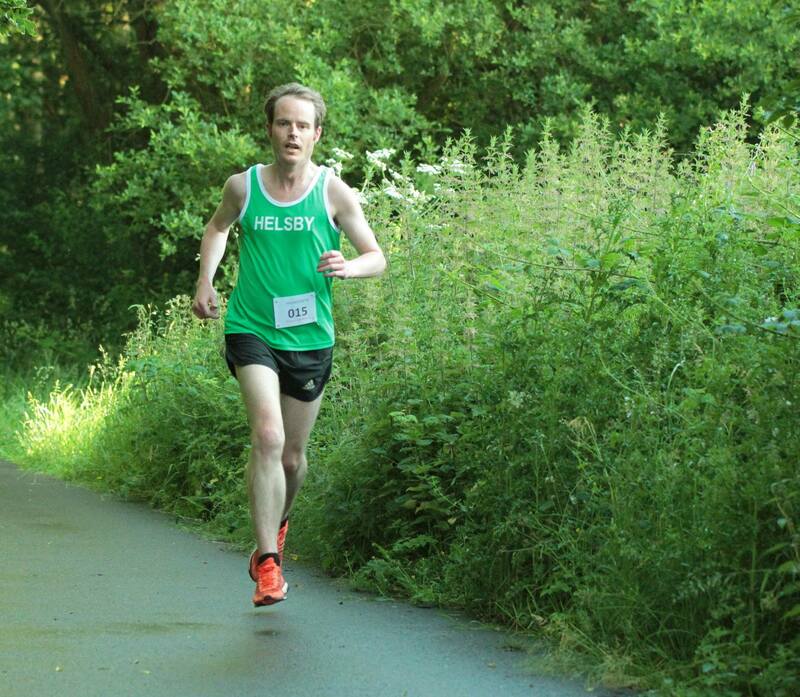 A truly stunning evening saw 17 Helsby vests in the Clwydians for the Green Green Grass of Home fell race. Traditionally the route would change each year, but of late had remained the same. Wednesday saw a new and IMO a vastly improved route – an initially shorter climb followed by a very runnable descent and second climb to return to the original route. Stopping short of Moel Famau it headed back down along the notoriously rough and lunatic looking descent. The unanimous view was that it would have been a far better choice for the Fell mini series than Hot foot as it was far more runnable and a cracking introduction to fell racing. It was clear on the line that everybody thoroughly enjoyed this one. Speaking of which, huge congratulations to both Jen O’Hare and Donna Geer for taking this on. Donna ran with Jane and Jen with Phil which saw all four of them arrive with big smiles on their faces. Huge thanks to Mario and Joe for their support on the course. First lady (for Helsby, 5th overall), Laura BH certainly attributed her fine descending to the fact that she knew master descender Mario was watching! With three Helsby vests in the top 10 it was certainly a great showing with Jimmy taking the spoils in 4th, Max in 5th and Adam Gordon in stunning form and 10th on the day. Prizes on the night for Janet Robinson and Nesta for second vet 40 and 50 respectively too! Another very well organised race by Mossley Hill AC this year again. As I found out last year it is a very fast flat course with great running from other clubs. However myself and Rachael Holden were there flying the Helsby flag with an impressive 43:49 minutes by Rachael and with myself (Chris Murray) being an exact minute outside of last years time in 34:48. The weather stayed nice and at the end we were rewarded by a medal and a mug although I did read in June that Gordon Ramsay was supposed to be dishing out post race curry however I didn’t see him! 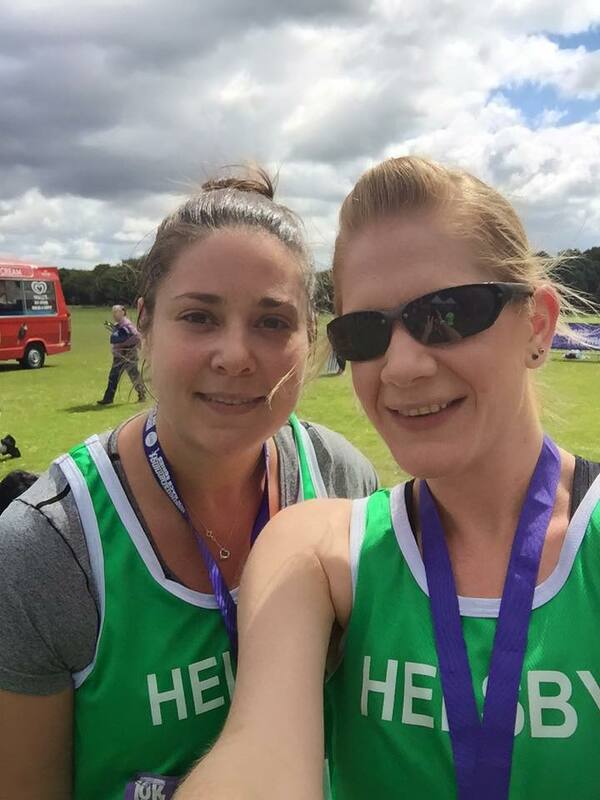 Just two Helsby vests took part in another challenging Run Wales Half two weeks after Chirk Castle. The autumnal conditions arrived in Conwy as forecast with the rain heaviest just before the official off at 11am. 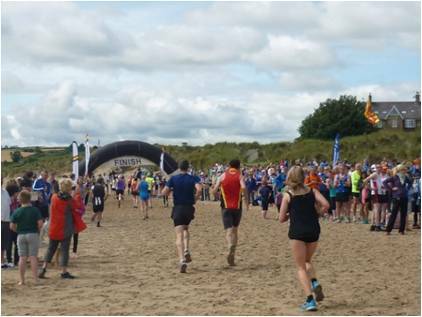 Can’t think there are too many races delayed because the tide hadn’t gone out sufficiently but that’s exactly what happened giving runners and spectators alike a further 15 mins soaking on the beach at Beacons in Conwy Morfa. A great all terrain race ensued, the beach 1st and last mile was incredibly demanding and energy zapping – the hard sand promised in the race blurb didn’t materialise, it was soft mostly, giving way under foot and the dash across the slippery rocks and pebbles was certainly a first for me in a “road” half marathon! The next 5 miles or so saw good fast flat road running and then came the climbs as we headed up towards the Sychnant Pass. The scenery quickly changes as we enter Snowdonia National Park and the earlier tarmac is replaced with trails and the climb up Conwy mountain summit is reached at around the 8.5 mile point. ; the scenery spectacular as you’d imagine. A hairy-scary decent is then the next challenge. Most (if not all) runners in road shoes struggling with grip down the grassy mountain banks and rocky trails – I managed to do my customary ankle turn in the process. Once back on tarmac with a couple of miles to complete, past the castle and back towards the marina and then the beach for that tough last mile – this time into a now brisk head-wind! I was quite pleased with my time of 1 hour 39 mins (41st overall, 12th in cat), with only 9 people running sub 1’30 you get a sense of how tough a course it was – certainly not one for hunting PB’s! 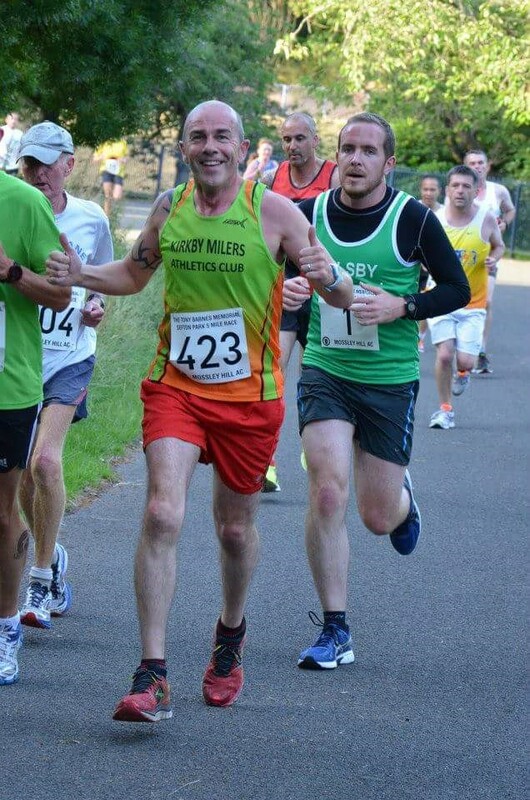 This then makes Neil Finegan’s 1 hour 31 mins and a top 10 finish overall (4th in cat) even more outstanding – superb running from a man in great form – well done mate! Would highly recommend this race given the multi-terrain challenges – not sure it’d make the Road Championships counter criteria though – one for the fixtures committee to contemplate maybe!? Jim Jones and our 2nd claim member Jamie Dowdall did the Harrock Hill ‘3’ race on Wednesday. This is a series of 4 races held every year. Anyone who’s ran the Parboiled Hill Race will be familiar with the area and at least some of the route. These races are on the Fell Running calendar but a with only around a 1000ft of climb and at approx 5 miles they are good trail races. If anyone is looking for an introduction to off road running, this series would be a good start. So watch out for it next year. Not seen the results yet but with Jim still nursing bruised ribs and what with Jamie coming back from an ankle injury can’t expect too much! Jen O’HARE:27:05 New PB! Well done Jen! Calling all Thunder Run runners! Thunder Run is a 24 hour off-road relay race against the clock ran in teams set in Derbyshire. It is an incredibly popular event with a massive over-subscription every year. The 2015 event has just occurred last weekend and it seems from my Facebook poll that there is sufficient interest in a Green Army attempt on this in 2016. Web registration for the event doesn’t open until October but will literally fill in a matter of hours so we are trying to get organised right now! It is assumed that the event will occur on the same weekend in July 2016 but is currently unconfirmed. We would set up camp either the night before which is advised (a Friday) or the morning of the race. Once you’re geared up, your first runner will assemble at the start line at 12pm and when the claxon goes, together we won’t finish for 24 hours. One team member must be on the course at all times during the 24hrs. Runners must complete one full 10km lap before changing over with a team mate but may run 2, 3 or more laps at a time before changeover. The team with the most laps completed when the clock stops after 24hrs will win. So, are you interested? If so please drop me an email to register your intent. I am going to set the cut off for interest at end of August and call a ‘meeting’ (bar after Wed run) in early September to discuss and agree the team makes ups – our Captains will have the casting vote. Hope that all makes sense. The fantastic Wirral Multi Terrain late summer series dates are released. I absolutely loved these races, probably my favourite local races I have ever ran. Please give them a go, great for beginners too. The results are in, from all 6 of us, and I know there are more than 6 going out! Friday 4th Sept, we’re heading to Chester, think the plan will be to head on down to the Old Harkers (directions to follow) between 7-8pm and then go on a pub crawl, we can either come back to Frodsham on the last train or stay out and find our own way home, it would be great to see some of the new members and old ones as well coming out to see really why you chose to join Helsby RC, you might want to leave come Saturday morning! Sorry there wasn’t enough interest to organise a coach, but the trains will do a good enough job, hopefully see you all there. Hello and welcome to your weekly news round up. The details of the winners have gone out, but it would be remiss of me not to mention the fantastic club awards, BBQ and disco. A great time had by all! Thanks to everybody that contributed and got invovled – especially to Dave and Lesley for organising the food, Bill for slaving behind the BBQ with Dave and Chris for the disco. Naturally there were many others that put a lot into that event, so thank you to all! One small omission from the awards was Ste Wiggins winning the Joe Beswick Runners Runner Trophy – I think he also won the award for most alcohol consumed from a trophy, but that is a different matter. Steve’s endless support of Paul in particular made him a very deserving winner on the night. Outstanding. 1. Frodsham 2. Chester 3. Liverpool If enough interest and its Chester or Liverpool I will organise a mini bus. Not sure No details this time, but a quick well done to Nic Cash and Laura Broughton. Fantastic work ladies and well done on your PBs (Nic – 55:39, and Laura with a season PB of 1:04. Thanks to Ian for this superb report from the latest Fell race from the club series. The #Fellsby contingent did us proud out there, I was gutted to miss it. Post race analysis from Ian was – A long way to go but a cracking race. All agreed that we should look to include at least one lakeland classic in the Helsby Fell Series every year – I couldn’t agree more!!! It’s 1 O’Clock and 7 of Helsby greenest and finest are standing on the lane just below the church in Kentmere. They are not alone,another 350 runners are with them. The starter has just gone through the rules causing much amusement when he warns us that emergency rations will be included in the spot checks of kit at the end of the race. Better not get hungry on the way round, maybe empty wrappers and a few crumbs will save people from a DNQ. Before the laughter has died down we get the go and promptly break into a walk whilst the large field squeezes down the narrow lane. Eventually we start to run and are getting up to speed when we stop again as the route diverts off the track on to a narrow path. Then we all form into a long line to march up the first mountain. A couple of short diversions means that attempts to gain a few places actually end up losing you a few. Once at the top of the running starts again but only briefly as a style over a fence forces another halt. After this the running starts in earnest and we head off across the moorland towards the first checkpoint on top of Il Bell. 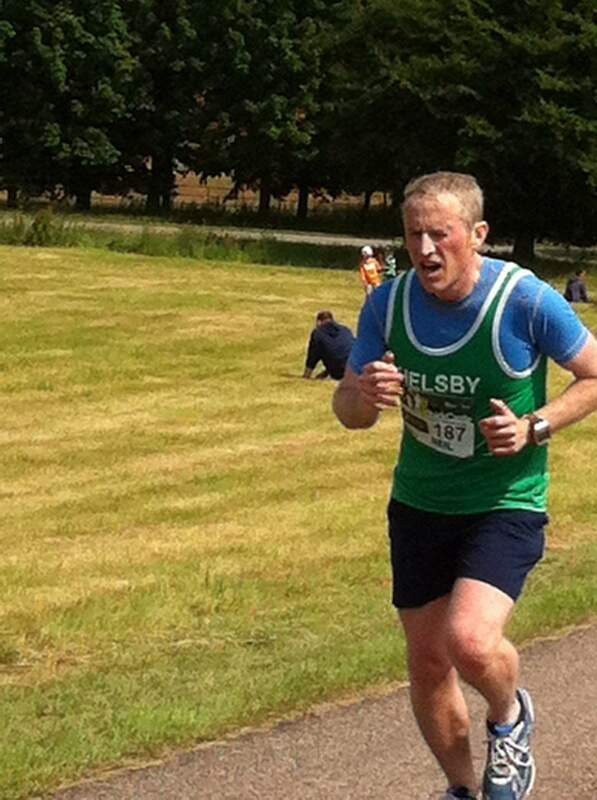 Jim is leading the Helsby pack the rest are all quite close together in the midfield pack. The moorland stretch to Il Bell is not too bad so the steep down hill section off the top comes as a bit of a shock to the legs. But it doesn’t last long and it’s back to the ridge and a combination of mountain side contouring and a stroll along the High Street. Though in this case the High Street doesn’t have any shops but is a more literal version being an old roman road across the tops. After about 50 minutes of racing we get to see the welcome sight of the top of the horseshoe. After several miles of chasing I arrive at the checkpoint just behind Phil. What I don’t notice at this point is that Steve is right behind me. This sets the 3 of us up for a cracking second half battle. The first section after the turn is a fairly straight forward moorland section and I keep pace with Phil until we suddenly reach a short but steep descent. After slipping a couple of times I slow down to avoid falling on some of the sharp rocks and Phil starts to open a gap. It is at this point I discover just how close Steve is as he comes flying past first me then Phil (I think Mario must having been giving him some lessons). Steve then rapidly ascends the next climb and gets a decent gap over Phil and me. Now we get a long section of moorland which is a mixture of flat and downhill. This should be an easy section but on tired legs I manage to trip over a rock and go flying. Back up with only a grazed knee but a few seconds lost on Steve and Phil. A minute or two later we hit the final checkpoint on the top of Kentmere Pike and from here it’s downhill to the finish, all be it 3 miles down hill. My legs start to recover a bit on my favourite fell race terrain “down hill but not too steep” After about a mile I catch up with Phil but we are still some way behind Steve but at least he is still in sight. All going well then we hit the final descent off the fells on to the road. This was probably the trickiest bit of the course being steep, rocky and down a slippy stream bed. I slow down rapidly and Phil starts to open up a gap. I manage to stay on my feet and get to the road but now a good way behind Phil. Still a mile to go so try and persuade my legs that they aren’t tired and get my road legs going. Can now see that Phil is gaining on Steve who looks like he might be tiring a bit. As we cut through some well made trails Phil overhauls Steve and I push on to see if I can do the same. Suddenly have to apply the brakes as realise there is a sign, cunningly hidden by a bush, showing the fell race goes hard right over a style. Just when you thought it was all road to the finish a short twisty section of path drops you down to the bridge over the river. Even better the path has a nice lot of rocks to avoid, which I don’t and go flying for the second time. Again not too much damage done but a matching graze on the other knee. Up and running again and now on the road again. Just get into my stride when two cars turn on to the road in front of me and they are going slowly as they have two runners in front of them. I want to go faster but can’t get round them as the roads are too narrow. Then one of the cars spots me and pulls over into a gateway to let me pass. I then catch up with the second car and follow it for ages though in reality probably only a couple of hundred yards. Then the 2nd car spots me pulls to one side and slows down as I overtake (First time I’ve past a car in a race!). Now it’s full pelt to the finish. As I turn sharp left I can see the finishing field I can also see Phil just about to cross the line. One last push sees me overtake a runner but not Steve who has now turned on to the field and is dashing to the finish. At last I get to the line and finish in just under 2 hours 15 mins. So was I disappointed about losing out to Phil and Steve. Not at all it was the best bit of racing I been involved in for ages. I am already looking forward to the rematch. I did the Widdop Fell Race on Wednesday night in the Heptonstall area. It was BM category race of 7 miles and 1200ft of climb. It was a great route that follows a lot of well defined paths but also had a lot of challenging knee high tussocks and shoulder high bracken. The weather was good but the setting sun made it hard to see where you were putting your feet at times- as i duly found out! 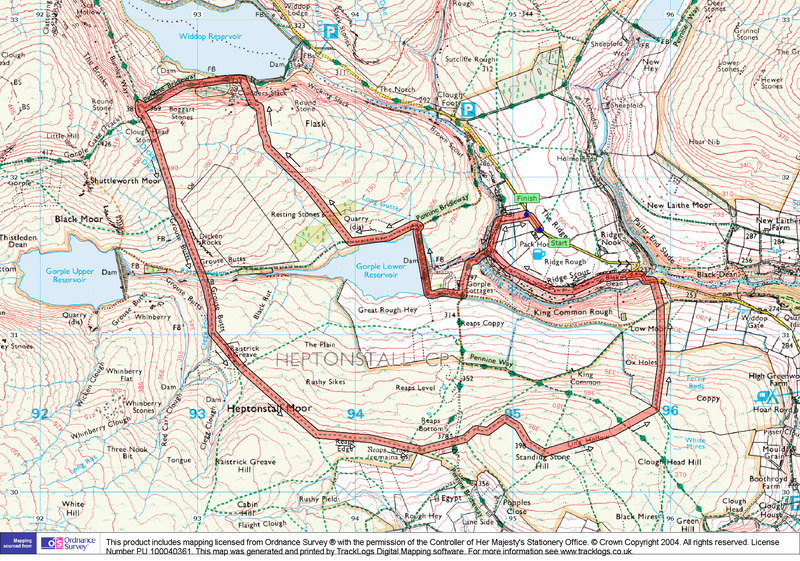 The area is well worth a visit for walking or running – start at the pack Horse Inn and follow the route on the Calder Valley Fell Runners site http://www.cvfr.co.uk/wp-content/uploads/2011/07/Widdop.jpg. 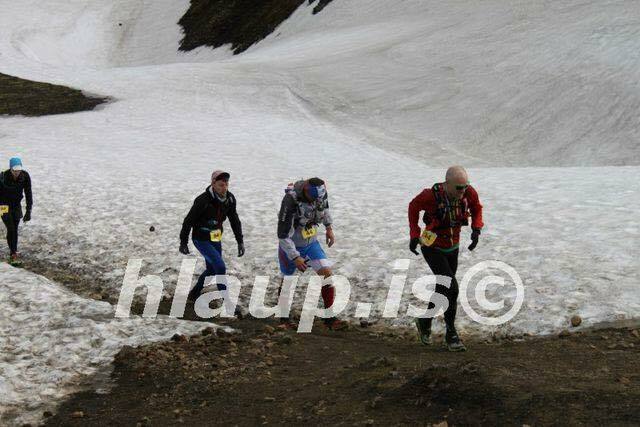 Young Maximilian of Frodsham travelled to Iceland for the Laugavegurinn ultra maraþon. A mere 55KM and no less! Trotting in with a massive grin on his face and 16th place overall. The winner was clearly head and shoulders ahead of the field finishing a full 30 minutes before second place. Maximilian spent 5:32:51 out there in varying temperatures and conditions underfoot – he swears that there was 10km of snow at first… you be the judge! Hat tipped Max, great to see that Helsby vest getting around the world. Speaking of which, Geoff Collins has been out and about in one of my favourite parts of the world: Northumberland. Over to Geoff for his report from the Northumberland Coastal run. 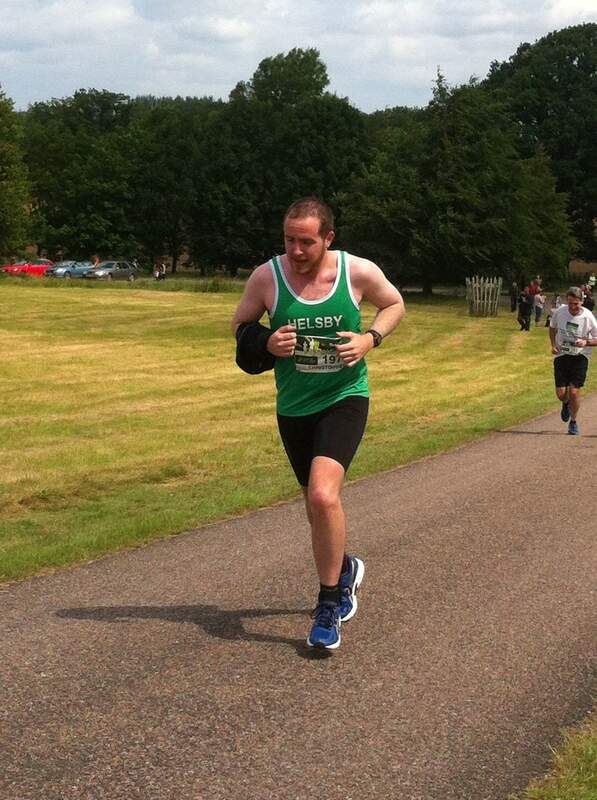 This year I ran this race wearing a green Helsby RC vest for the first time. 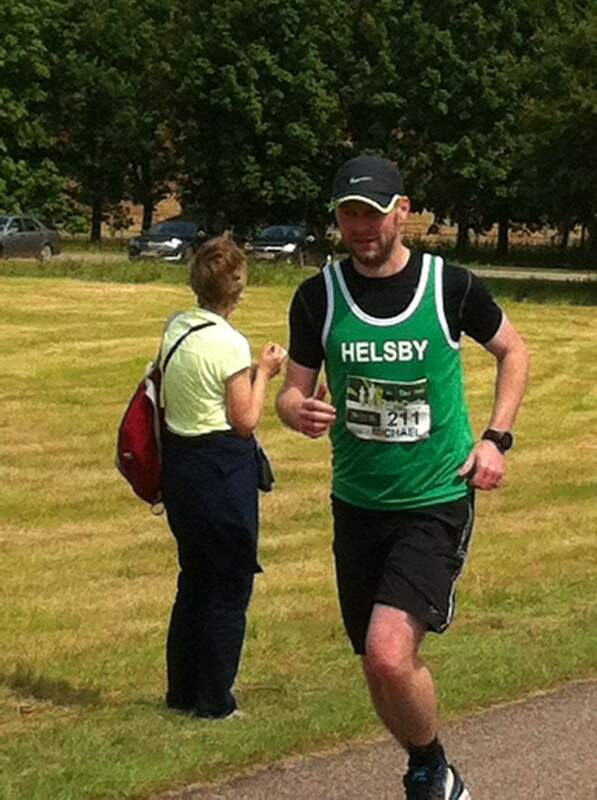 Confident I would be the first finisher (and only runner) for Helsby! Outside the North East, few people know about this event. My NE running friends jokingly suggested I should say this is a rubbish event and very poorly organised! That couldn’t be further from the truth, this race is a really gem, with beautiful stunning views all the way! Alnwick Harriers organise this race, this year celebrating its 35th anniversary. Alnwick is of course much better known for its famous castle and garden, which featured in the Harry Potter films. 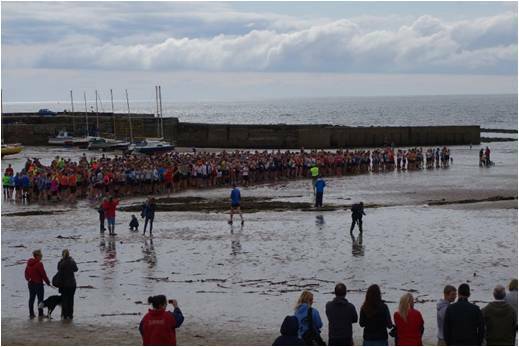 The first ever Beadnell to Alnmouth Race was held in 1979, with only 12 competitors. 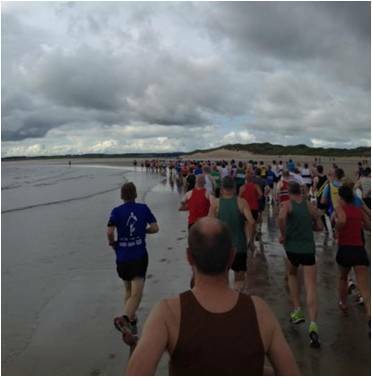 In the beginning competitors had to choose their own route starting in the sandy bay next to Beadnell Harbour and then heading south running to Alnmouth (approximately 14 miles). This year there were 1,200 entrants and 997 finishers. Apart from one or two sensitive areas the course is unmarked and competitors choose their own route. The established course makes its way from Beadnell starting on the beach, towards Alnmouth using the coastal footpaths and a couple of short sections on tarmac. From Beadnell Bay you head South via Newton Links, Low Newton By The Sea, Dunstan Golf Course, passing the impressive Dunstanburgh Castle, Craster Village, The Heughs, Cullernose Point, Howick, Sugar Sands, Boulmer, Foxton Beach, and finishes on the beach at Alnmouth. There are rocks, seaweed, lots of sand, running water and the sea lapping at your feet to negotiate. Wet feet are guaranteed. We left Newcastle in the rain at 7.30, by the time we arrived it was dry cool and much brighter, although there was a quite a brisk South Westerly breeze blowing as we all lined up for the start. Just before the race started I spoke to Mary Rees from Wallasey AC who was the first lady vet 60 finisher today! The start is always wet, as you follow the retreating tide round the bay, past the bird sanctuary aiming for the top of the sand dunes. You cross Brunton Burn where there is a lot of flowing water. From High Newton you start to climb on the coastal path towards Dunstanburgh Castle. The castle stands very majestically on the horizon especially today with perfect visibility. The path undulates away from the Castle as you head towards Craster a very pretty village where there is the distinctive aroma from Robinson’s Kipper smokery! Onwards towards Boulmer where the Search & Rescue Helicopter station is (which closes later this year). Then you start a gradual climb along the road out of Bulmer. Trying my hardest to get as much speed on this section. Then you descend down the steps towards Foxton beach. That’s where I noticed a load of people jumping up and down shouting ‘look there’s someone from Helsby here’! In my excitement I almost lost it as I launched myself at speed onto the beach. On the sand I realise the wind is almost a headwind. It’s hard going digging in and trying to get some speed on the sand, threading your way past and over the seaweed and rocks. Finally you aim for the finish arch way in the distance at Alnmouth. The race was won by Carl Avery in 1hr 15m, first lady was Emma Holt 1hr 29m, both from Morpeth Harriers. I took a more sedate 1hr 55m – at least I was 3 minutes faster than last time. And you get a lovely quality More Mile long sleeved t-shirt with zip up front and reflective trim! Great work Geoff – certainly a race I think Mrs. Baynham-Hughes would like a go at next year. A handful of Helsby vests out on the Park Run this week. 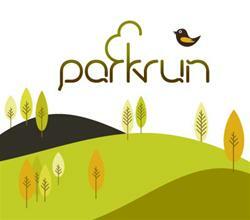 See here for full details: http://www.parkrun.com/results/consolidatedclub/?clubNum=1721 – Well done to all! We’re delighted to announce the following winners of the 2014 road and fell championships and the 2014/15 XC and Border’s League winners. Congratulation all on your trophies, representing a lot of dedication and hard work. Thanks also to everyone else for taking part — you’re all winners! A very busy week of racing for the Green Army and lots to report. Thank you to everyone who has contributed with race reports and results, it is much appreciated. Remember all reports can be sent to helsby-race-reports@outlook.com. Before the news there are just a few reminders about some races and events on the horizon. 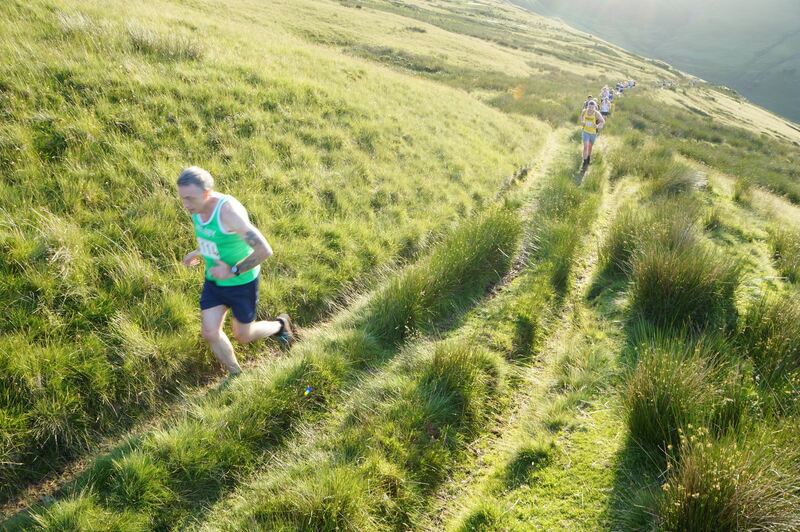 Druid fell race today (Wed). Lovely and friendly fell race, hilly but not technical – 5m and 1200′. Starts Druid inn on the Mold-Ruthin road after loggerheads. 7:30 start. So club meet 6:15 anyone that wants to lift share. Sunday 19th July 1pm Kentmere Horseshoe (fell club counter). “After having put my name down for the SLMM a couple of times in the past, only to later pull out through injury both times, 2015 was the year I actually made it to the start line. My son James is now a keen runner and so we went for the Bedafell class, which is for 14-18 year olds plus their parents. There was a bit of added spice as one of our friends and his daughter were also running, and he’s got a few MMs under his belt. After travelling there in the morning, our Saturday run started at 9:17, four minutes behind our friends. With me being a Scout leader and James an Explorer Scout, we managed to overturn that four minute deficit by the time we’d finished map plotting at the start, so we headed off up the hill together and found the first control without too many problems. Shortly after that however we hit the clag, and I had a poor couple of controls navigation-wise as I can’t really judge distance up in the hills. Our friends were long gone by then, but the rest of the day went broadly better, apart from struggling to find the second-last control as I’d marked the obvious re-entrant on my map when it turned out to be another one. After wondering around in the mist for a while it was good to get a decent amount of running in. James led the charge down the hill to the overnight camp, as his young knees are much better than my crocked ones. Of course our friends had their tent up and were relaxing by the time we made it down, having lost 32 minutes 26 seconds overall. Still, we were still doing OK overall in the top third, so were pretty pleased with our first attempt. We were blessed with a lovely afternoon and evening at camp, with most people wandering round in bare feet. I’m sure in some Mountain Marathons the camp is hard work, but we chose the Saunders in the hope of good weather and got lucky, which makes the camp pretty pleasant (especially with being able to pre-order beer!). Packing for a MM is clearly a balance between comfort and weight, and suffice to say we had plenty to eat and a good night’s sleep with the option we chose. Our friends started day 2 about 15 minutes before us as they were worried about the weather closing in. Day 2 is a bit of a procession at the start, as a lot of people are going the same way and starting close together, but after a while the route choices kick in and the field is more spread out. The main climb came fairly early in day 2 with the sun beating down on us, which made navigation for me a lot easier, as I was able to take lots of bearings and pick points on the horizon to aim out. James was also running well so it felt like we were having a very good day. Even contouring round the main hill through boggy ground felt good as we were running (and in the right direction!). After one more big climb it was time for the big run downhill to the finish, about 2.5 miles with a couple of controls on the way. 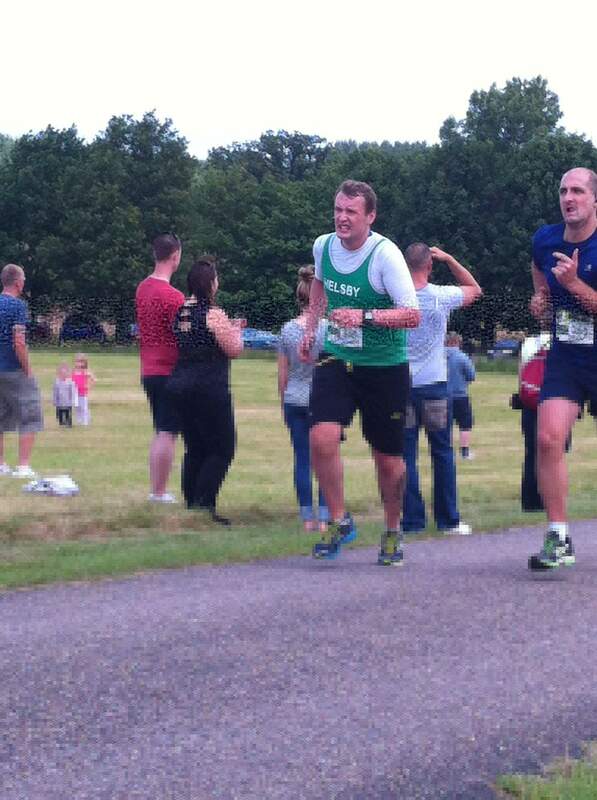 Again James led the way with me grimacing behind, and nearly falling just before hitting the finish field. It was all smiles from us at the finish as we felt we’d had a great day on the hills and make a good fist of day 2. Loads of decent food, included in the entry fee, was waiting at the finish. Fantastic running Ed, well done to you and James. Thursday night 9th July was the Dearnford Lake Relay event with a huge turnout from the Helsby contingent. Each team consisted of 3 legs each of 2 miles as a relay. 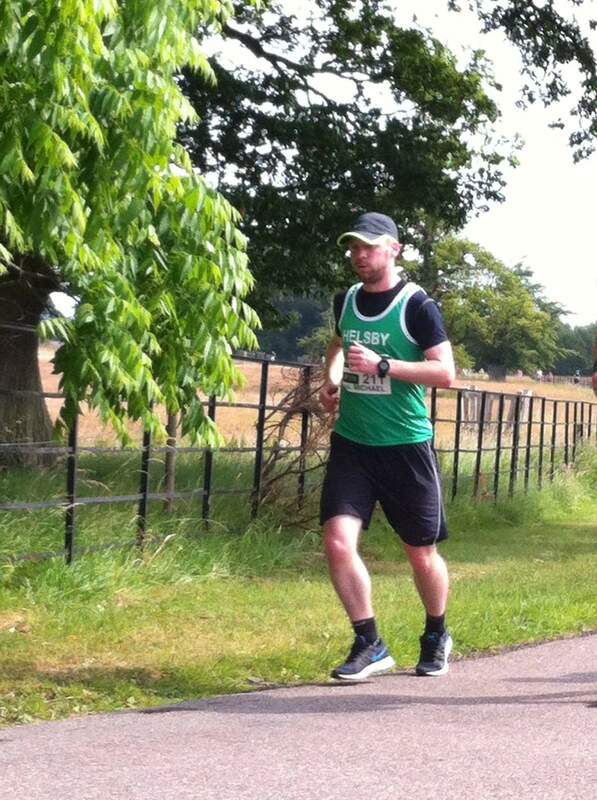 There were 36 out in the green vest and some fantastic performances too. There were over 110 teams out in total so it shows how well Helsby did on the night. Lots of stats to work through at the link below for the full results. Teams and placings are shown below with an individuals time next to their name. Helsby ladies had three of the top ten fastest lap times on the night with Jenny Illidge (fresh from her GB rowing excursion), June Swift and Alison Halsall all having an excellent run. The ladies also secured 2nd and 3rd team on the night! Colin Bishop was in the top ten for male lap times. Well done to everyone on the night and a fantastic event to highlight the current strength of Helsby RC. Thank you to Carol for sorting the ladies teams and thanks to our support team on the night Joe and Mario. Also a big thank you to Jane Bishop for providing the flapjacks and cookies at the finish. It was great to see a lot of new faces too, I hope you all enjoyed it! Sunday saw our 6th race in the road championships and 13 Helsby vests ventured to Chirk to do battle and fight it out for those valuable club points. 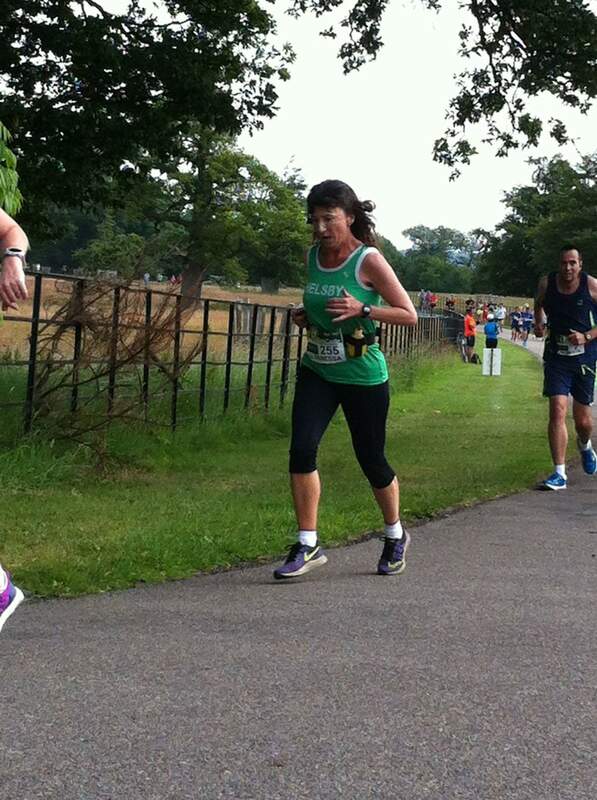 Thank you to Jackie for sending a report and well done to everyone who participated in the event, some very impressive times in what looked like a tough and undulating course. It’s great to see some new names in the results too. “Sunday morning saw a Green Army contingent line up for attack at the top of a steep hill outside the portcullis castle entrance; a great vantage point with with clear sunny views east to our home territory of the Sandstone edge. The inaugural Chirk Castle Half organised by RunWales was a gem; the road equivalent of the Wobbler, with plenty of unrelenting hills. A great course through the picturesque grounds of Chirk Castle, shady lanes, sheep dodging, some off road, before the big descent down into Chirk village itself. Past the parish church with the bells ringing out and cheers from Joe and Mario before entering another picturesque private estate of Brinkinalt. Back through the village and more encouragement from our cheer leader twins before the long hot haul back up the hill and into the castle grounds. Still not quite half marathon distance yet, so an extra up then down before the grand finale. Through the main lower gates and up the 1 km main drive with an 80 m steadily rising climb thrown in. Plenty of green army encouragement from the Helsby brigade plus the commentator, who by this time had taken our side. Then the final crawl over the finish in front of the castle gates. Only 309 finishers but a great race which hopefully will be on again next year and well worth supporting. Helsby men were defeated narrowly with the men’s team prize going to local boys Wrexham AC. Vannessa got the V50 ladies prize and Jane, Vanessa and Jackie the ladies’ team prize. Victory medals were awarded to all foot soldiers. 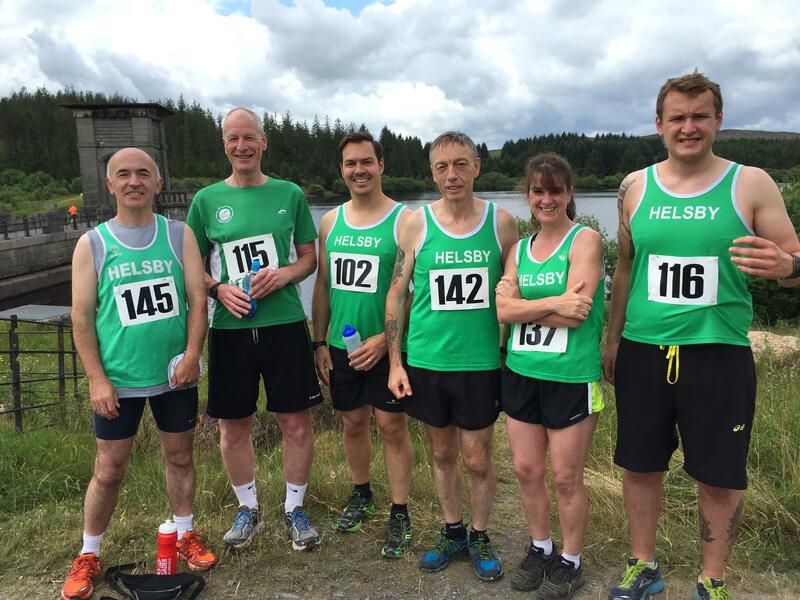 A special mention to Steve who did the weekend double, running Pen-Y-Fan the previous day and a big welcome and well done to Michael and Gillian for their first outing wearing their Helsby uniform! Yesterday, Jim and Gareth headed off to Astley to take part in the Lions Bridge Marathon. The course was most off road (with only a little road to cover) and involved a 6 lap un-inspiring course – no offence Astley, but your never win Travel/Trip Advisor awards! Jim (slightly disappointed with his time) is now off to seek out his next challenge. Gareth meanwhile will be doing John Wayne impressions for a few weeks – lesson to all ‘its not big and clever not to train properly for a marathon. That’s all this week, please get in touch if I have missed anything. A big thank you to everyone who opted to donate their refund from the 2015 Essar Four Villages Half Marathon to our charity partners. We’re delighted to announce we’ve been able to donate over £25,000 to local groups involved in the race and our two local hospices, Halton Haven Hospice in Runcorn and the Hospice of the Good Shepherd in Chester. We’ve already had fantastic feedback on the difference this money will make to these organisations. So a big thank you again. We’re now planning for 2016 and are making some changes to try to ensure the weather doesn’t beat us again. As you may remember, we asked all 2015 entrants if it should be moved to later in the year. Around 1,500 entrants responded and over 70% wanted it to remain in January. We’re pleased to let you know next year’s race will take place on Sunday 17 January 2016. Entries open 1 October 2015. Check back in September for entry details. We hope to welcome you again to our race in January. 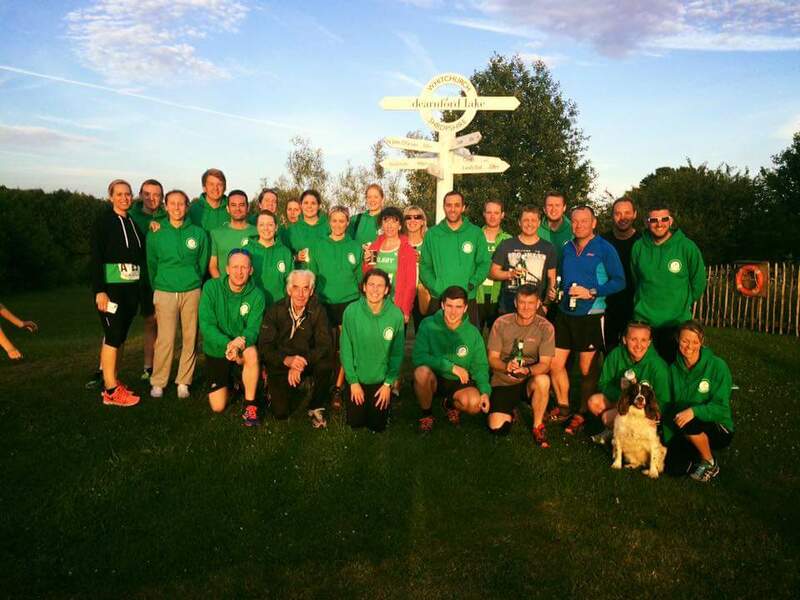 Helsby runners were out at Delamere, Widnes, Ellesmere Port and Warrington Parkruns. Highlights were Colin Bishop winning at Widnes and Geoff Collins setting a PB at Ellesmere Port. Well done both. 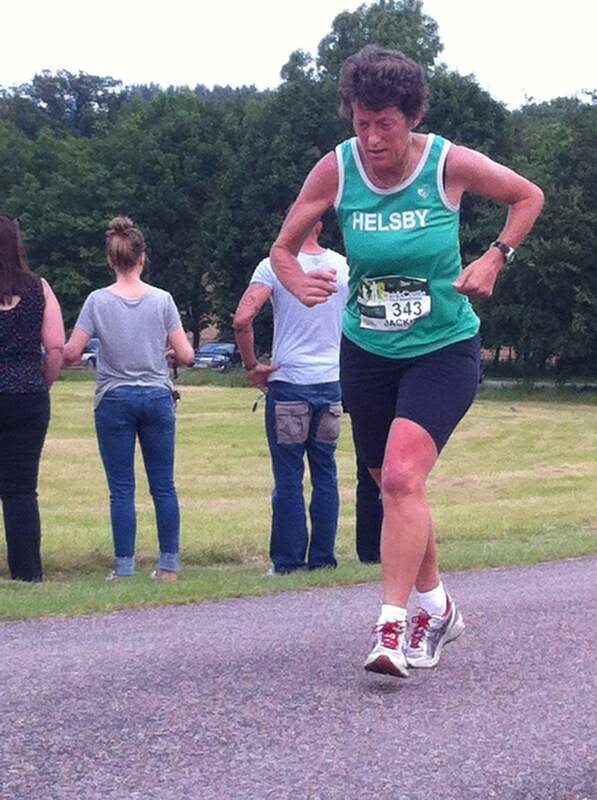 Full, consolidated Helsby Parkrun results for last week and be found at the link below. 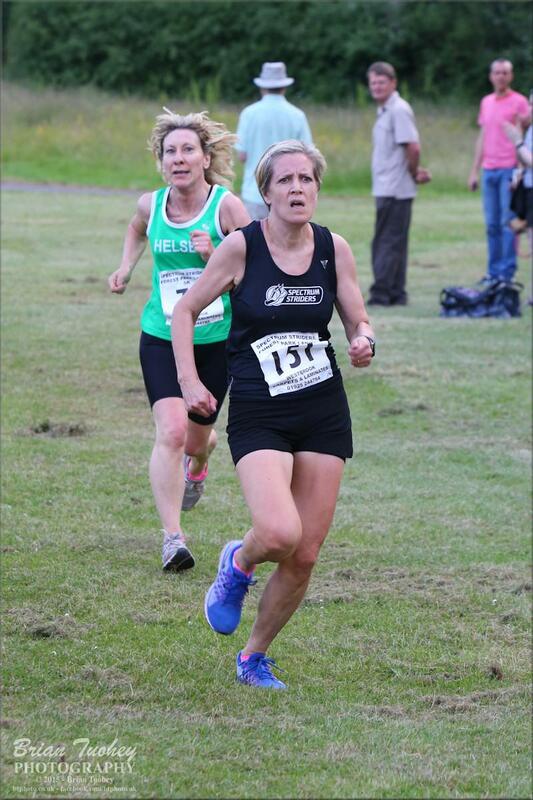 On Wednesday there was the Ladies Forest park 5K with a strong showing from Helsby runners, first home for the club was Jane Ashbrook who was also runner up in her age category. Great running Jane, full results below. 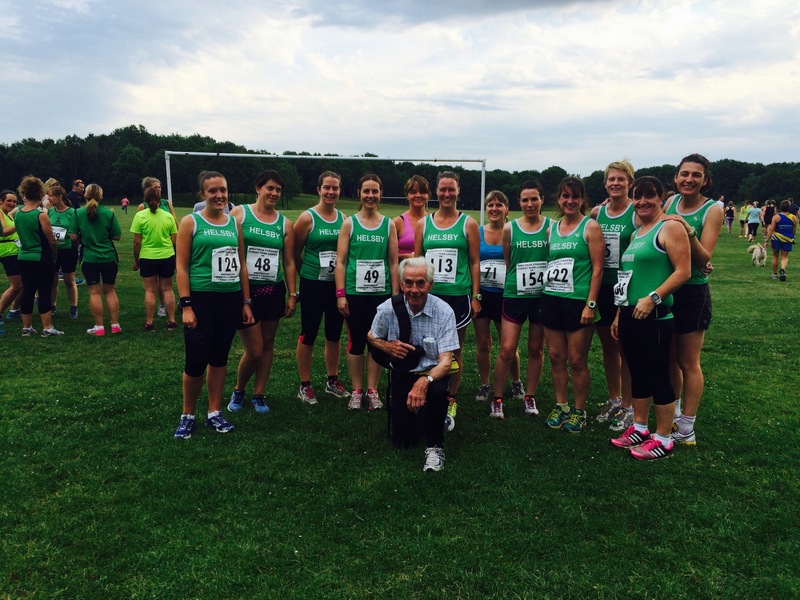 Thursday evening saw Knowsley Harriers hosting their 4 mile race. Club Captain Colin Thompson sent in the following report. 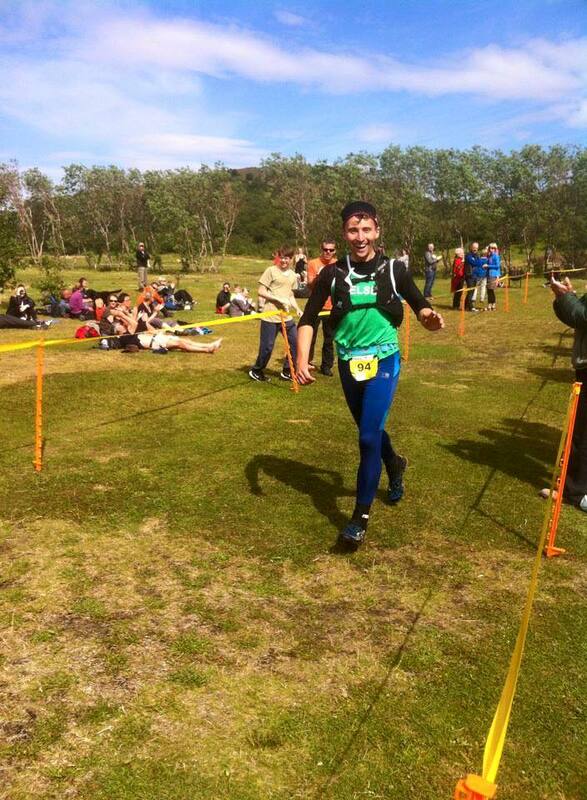 Jackie Kearsley writes from the Saunders Lakeland Mountain Marathon….. The 37th Saunders Lakeland Mountain Marathon was held this weekend. Lesley and I arrived at the start at Torver, just down the road from Coniston on Saturday morning, the thunder and lightening had just passed over but within a couple of hundred meters of climbing we were in a real pea souper with visibility down to a few metres. Lesley wanted to practise navigation and this was an ideal opportunity if not a little in at the deep end! The first few check points were well spaced, the first not far from the start, the second miles away on Grey Friar above the Duddon Valley. There were many route options so everyone soon disappeared; we plodded onwards on upwards in splendid isolation overs Goats Hause, then traversed high level over Brim Fell and Swirl How towards Grey Friar to find a “tarn between hills” which should have been renamed “puddle hidden by tussocks” as it was no more than 2m across and could not be seen from more than 2m away. Competitors came from all directions in search of this obscure mini target which was eventually found to everyone’s relief. Onwards over towards Dow Crag and another pass by of Goats Hause, which now looked completely different as it was gradually clearing. Over the Old Man of Coniston and through the coppemines towards the lovely placed, sun basked overnight camp at Tilberthwaite. Ed Halliwell and his son James were there, doing their first mountain marathon, having done a great time in the Beda Fell race, the special adult and child. class. Both seemed happy! The usual feast of beanfeast, noodles, Guinness and cider replenished us and ensured a good nights kip. Sunday saw us clamber up Wetherlam Edge over Swirl How and onwards towards a different part of Grey Fryer, again, before nipping over the Walna Scar back towards Torver. It all looked very different in the clear sunshine! The amazing Colin Bishop made it 2 wins with first place in the Northern Vets at Radcliffe in a tough, hilly, 2 lap 10K. With first place came the Joan Rhodes Memorial Trophy. Brilliant stuff, Col.
Sunday saw a big turnout at the Alwen Reservoir for the Fairy Freckled Cow trail race, boosted by six of the Green Army. Jim and I had run the race before, but the others were first timers. It’s a lovely course of about 11k on tracks and trails around the reservoir, with a little hill climb at the halfway mark just to maintain interest. There was more interest than usual this year as the heavens opened just as everyone hit the hill – some thought it was hail, I’m not convinced but that tells you how hard it was raining. As an unexpected added bonus, Joe and Mario were supporting around the far side of the lake, in one of the remotest areas in North Wales. I have no idea how they got there, but it’s such a boost to get their support. 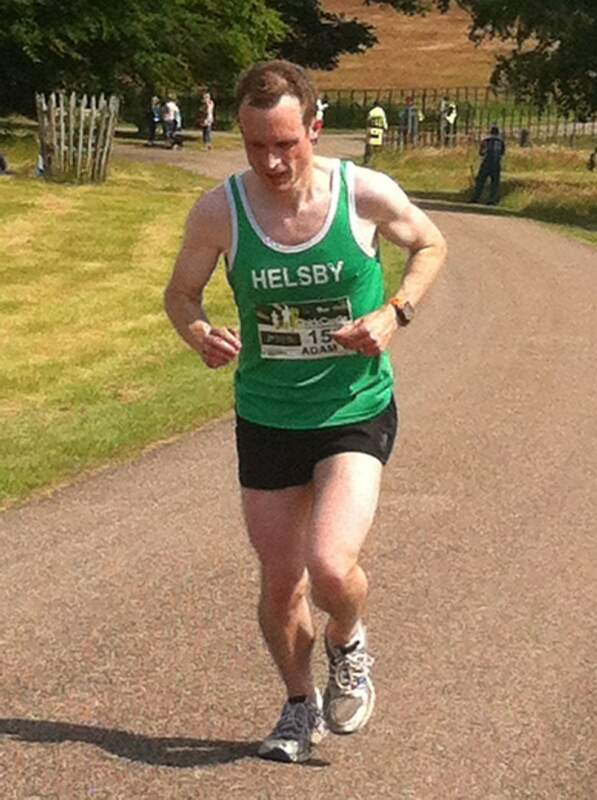 Jim finished first for Helsby, and I think about 17th overall, which is a cracking result. I was pleased with my run, and knocked about 2 and a half minutes off last year’s time. Louise pushed me all the way – every time I looked over my shoulder she was there, and I suspect if she didn’t have a self-inflicted poorly head she would have beaten me. Steve ran well after doing some crazy obstacle race the day before, and Graham and Dave can both be pleased with their running. And we all got a T-shirt with a picture of a cow wearing a tutu… what’s not to like? Carl Pratt also completed the Southport Half Marathon in 1:33:30 as the part of the week long, 6 race, 53 mile Tour of Merseyside. Well done and keep going, Carl! 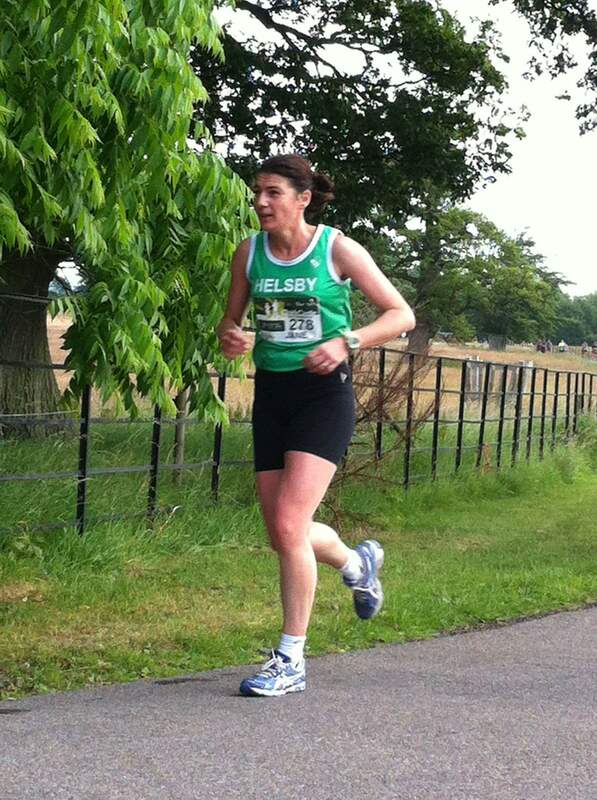 Missing from last weeks blog was a report from the Penny Lane Striders 10K which was also a Helsby club counter road race. Adam Gordon kindly took time to bring us up to date on the race. 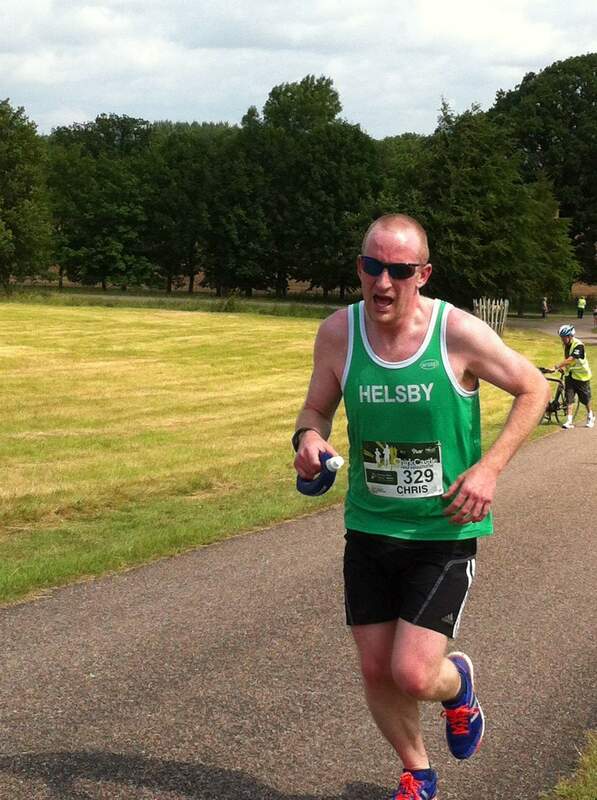 The Penny Lane 10km on Sunday 28th June saw 15 Helsby runners competing for points in the 5th counter of the Helsby Road Champs (including a student who hasn’t had his running shoes on for 9 months!). Although on a flat course, the wind on Otterspool promenade made for a race of two halves with an easy(ish) outward 5 followed by a considerably harder return leg. 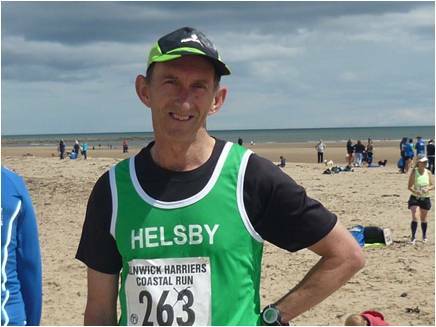 The race was won in 32:38 by Haccalu Hundeessa of Liverpool Harriers, with Colin T coming in first for Helsby in 11th position overall. Lots of good running from the Green Army with some great category positions too. A sprint for the line saw Carl edge in front of Ian L but if the Helsby championship points are awarded on “net time”, it looks like Ian may have nicked 4th place! Who decides? 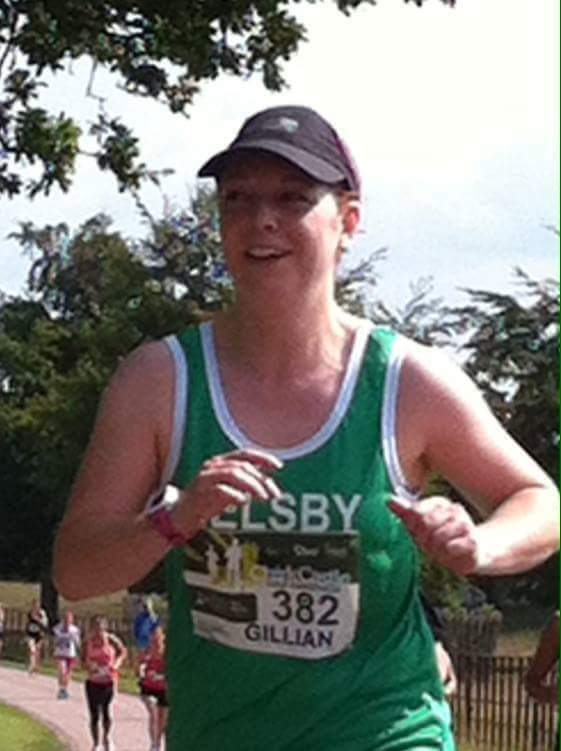 Tanya Meredith recorded a superb PB and is in a rich vein of form at the moment while the Helsby Men were the 5th placed team, although this might have been better had the organisers recorded Chris F as a Helsby runner. Lastly a quick reminder about the eagerly awaited Annual BBQ, Presentation Evening and Chris Igoe Disco on Friday 17th July. An email will be send out this week from Lesley and Dave with catering details and time. otherwise we don’t know about them. If you’re at a race/ event then please decide amongst you who will put together the report as if we’re not there then we won’t know 🙂 There wasn’t much in the post bag this week and I’m pretty sure more has been going on. If it is missed then please let us know and we’ll either update the blog or we’ll include it in the next racing newsletter. Fells This weekend sees the SLMM (Saunders Lakeland Mountain marathon), Moel Siabod (one for Fitzy?) Skiddaw and the Langdale Gala Next weekend boasts Wasdale, Tal y Fan (NW Counter) and the Bollington Nostalgia. Technically last week, but I’ve been away 🙂 This race has only been going three years, yet it was a Welsh championship counter last year and will be a British Championships counter next year; I think that tells you how special this race really is. Max had a hangover and Phil R was working his way up to one so just two Helsby vests toed the line. The run out to Moel Hebog and the slog to the summit quickly turned into 20m visibility at best and some rather inefficient lines to the top. I packed in with some Eryri runners, one of whom lived just 10 miles away from the start. It added a good 25 minutes to my summit time from the previous year due to none of us knowing where we were going. Jackie had similar luck. The running was still spectacular and particularly dramatic when the cloud lifted to reveal the most beautiful of landscapes. Jackie packed in with two other runners and thoroughly enjoyed her trip around. Arriving at the 3-4k road section at the end I was still grinning from ear to ear despite being 35 minutes behind my previous time. Cakes, showers and a cystal clear view of the mountains awaited us at the finish – one I’ll certainly be back for next year. The Clif Bar Lakes 10 Peaks race on Saturday. 45 miles, 18000 feet of climbing, including the 10 highest peaks in the Lakes. Just over 100 runners started the “Long” race, including me. 65 finished. The winner was Ross Litherland of Pennine Fell Runners, in 10:46:17, & I came in 18th in 15:14:35. I was first MV60 – actually I was the only MV60 to finish. I’m still absolutely knackered 2 days after finishing, but I’ll get a race report up on Runfurther.com in the next day or two. Pretty outstanding running there Andy! Ok, so I wasn’t racing it this time, but I was marshaling; specifically on the control team thus I got to run my own mini dragon in order to put out the dibber boxes (controls) for the competitors. This is the third running of the legendary Dragon’s back – a 5 day 200 mile race across the mountainous spine of God’s own country. 50,000ft of ascent is covered and the vast majority is rough going underfoot and pathless. If you know your way around, get lucky or think like a sheep then you can hit a trod, but if you don’t then places like the beautiful Rhinogs can be very unforgiving environments. What an incredible week it was. All I saw were heroes, controls, bogs, tussocks, gnarly rocks, and unspoilt beauty in both human spirit and landscape. What a race this is, it strips every one of them down to their most raw self and shifts the horizons of all involved. To watch that unfold and be a part of it was amazing and so nice to give back to a sport I love. If any of you are thinking of marshaling then I thoroughly recommend you put yourself forward to help at the races you love, the organisers will always be grateful of help. 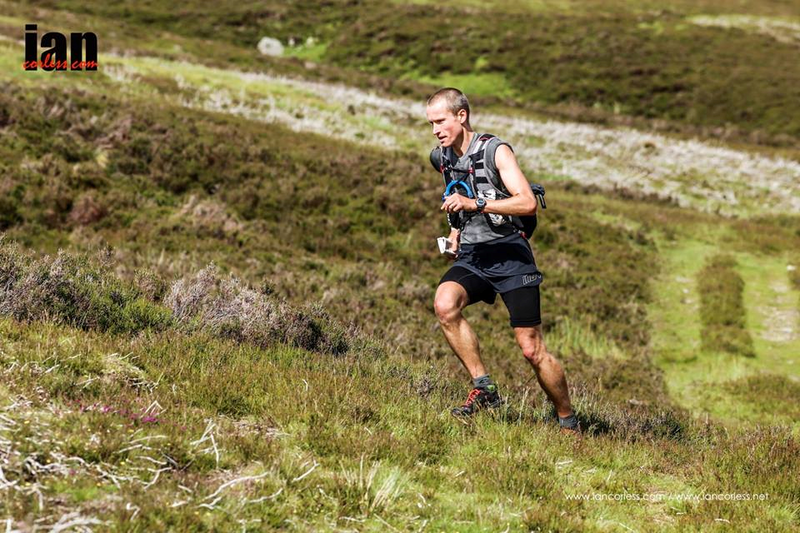 In the end Jim Mann took the win followed by the Jasmin Paris in second overall. Both were utterly formidable. I know Jim from various adventures; he’s a quiet hero and as close to selfless as it gets, I was over the moon to see the huge amount of effort he put into this race pay off with a win. 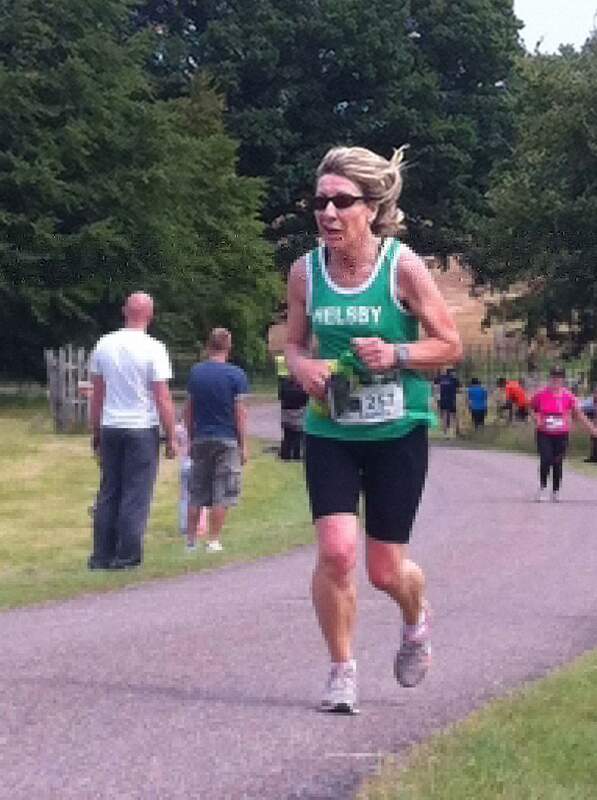 Nice to see plenty of Helsby vest out on the various park run courses. Fantastic little events that guarentee you improved times elsewhere. Why not put it into your weekly training plan?